He advises investors to look for commodities that are still cheap. From that perspective, he sees opportunity in sugar and rice. Overall, Rogers thinks agriculture has a "wonderful future" in the next 5-15 years due to diminishing farming activity around the world. Rogers also sees a U.S. bond bubble and indicates although he is not shorting the U.S. Treasury in any "significant way" yet, he may not wait much longer. "Gold is going to go a lot higher over the next decade. It may slow down for a while because it's run up so dramatically here in the last few weeks. But gold's going to be much higher. Adjusted for inflation it should be well over $2,000 now." 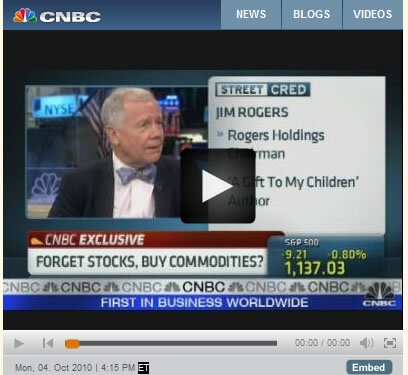 Rogers says gold will continue to gain on the failed monetary policies of the U.S. government. In precious metal, from a valuation standpoint, he thinks silver would be a better investment than gold right now as it is still 60 percent below its all-time highs, while gold keeps making all-time highs. But he also tells investors holding onto gold and not to take profit at this juncture. He owns both metals. Rogers said based on experience, he's found in life it is better to be a contrarian. Applying that philosophy, Rogers does not think he would sell any more US dollar at this time, and if anything, he might contemplate buying instead, since everyone is so pessimistic about the dollar right now. He also said he owns some Chinese, Malaysian shares and some international airlines, but cautions against jumping on the "moving ship" of Brazil. Rogers has been quite consistently long on agriculture, gold and silver for the past year or so. I generally tend to agree that gold and commodities could head higher driven by the fear factors like currency debase and inflation arising out of the global monetary QE1 and incoming QE 2. However, with regards to silver, I am going to be a contrarian this time around. Gold has had a spectacular 20% run-up this year hitting new all time highs, but it pales in comparison to silver. On Monday, spot silver prices shot up to $22.13 an ounce, a fresh 30-year high, up a staggering 31% this year. On the surface, Rogers has a point that silver is still a long off its all time high, which was reached in 1980 when the Hunt brothers decided to buy up almost a third world’s deliverable supply of silver as a hedge against inflation. Within one year, silver went from $5 to peaking at $54 in 1980. Ultimately, COMEX and Federal Reserve intervened resulting in the collapse of the silver market. Now that we've had a crash course on the history of sliver, it should not take long for one to realize that, in contrast to gold, there’s very little chance for silver to touch, let along surpass that all-time-high mark. Furthermore, since both gold and silver are part of the precious metals family, silver has been attracting interest of fund managers as a cheaper alternative to gold. But unlike gold, silver is also a base metal, since around 40% of the silver supply in 2009 was used in industrial applications such as electronics manufacturing. So, silver, more base metal than precious metal, has essentially been piggyback on gold as an investment metal based on attractive valuation relative to gold. However, silver is called “’Poor Man’s Gold” for a reason, as it has by no means the similar stature and glitter of gold in terms of wealth preservation and being the ultimate safe haven. And as the current price level seems to suggest quite a bit of "faux" fear premium has built in, the white metal appears overbought and could be heading towards a bubble stage.